Article written by George Stefano Pallas. School spirit and lingering optimism practiced by the author are his alone and do not necessarily reflect nor should be construed as those of the Author. On January 25, three print-outs of a poem attributed to Pepperdine University Chaplain Sara Barton were pinned to the Freedom Wall outside the school’s main cafeteria. The poem was written in some kind of free verse and appears to have been addressed to another user of the wall, although the lack of specific details in the text leaves no definite pointers to the context of the poem. In it, Barton voiced disapproval with the way that certain individuals exercised their freedom on the wall, using words and images she deems hurtful, and asserted that freedom of this kind is a form of voluntary slavery or entrapment. 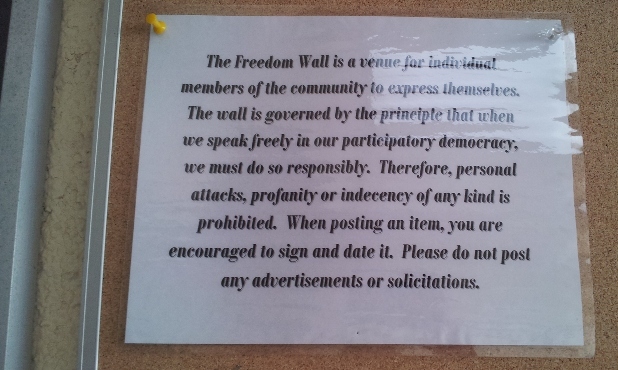 Although it was initially instituted as an open bulletin board for expressing their opinions, most Pepperdine students utilize the so-called “Freedom Wall” as another advertising place for fraternity recruitment, club events, off-campus apartments, and other illicit materials that can be displayed in no shortage of other locations. The Freedom Wall typically goes many weeks without receiving new student-authored content, and when someone does pin something of an unpopular or conservative bent to the Wall, it’s often torn down within a matter of hours. In the short time preceding the poem, two articles were posted to the Freedom Wall that may have inspired Barton’s response. 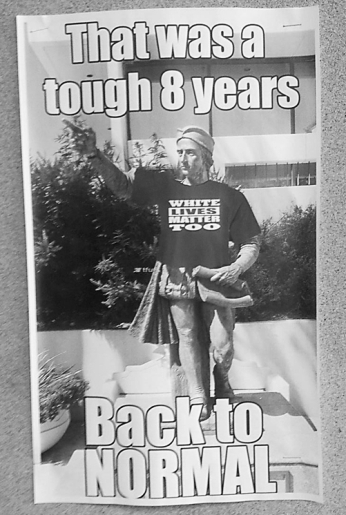 One was a meme posted on January 20, the day of Donald Trump’s inauguration, which depicted Pepperdine’s since-banished Christopher Columbus statue wearing a T-shirt emblazoned with the phrase “White Lives Matter Too”. The other potentially offending target of Barton’s criticism was a set of posters created by the conservative group Turning Point USA that used quotes from TV figures to promote free-market capitalism and freedom of speech. Although the Files’ staff arrived at the scene too late to examine the materials in question, the Pepperdine Graphic newspaper reported afterwards that someone had scrawled obscenities, presumably of the hateful variety, over the posters and removed them within a day of their being posted on January 12. The warning is taken almost verbatim from the Student Activities handbook, excepting the part about the types of speech prohibited, but the print-out doesn’t identify whether a student representative, a staff member, or some other actor posted it. According to Turning Points USA’s website, the mission of the group is “to identify, educate, train, and organize students to promote the principles of freedom, free markets, and limited government”. None of the posters distributed on the Freedom Wall expressed animosity towards any group based on non-political attributes. With this in mind, it remains uncertain to what exactly the Pepperdine chaplain was referring when she wrote, “So to the persons who disgraced / our community freedom wall / with words and images designed / to wound sisters and brothers who are not you, / heed not my words or views, / but that of natural law.” To date Barton has made no other public remarks about the systemic suppression of conservative articles on the Freedom Wall. 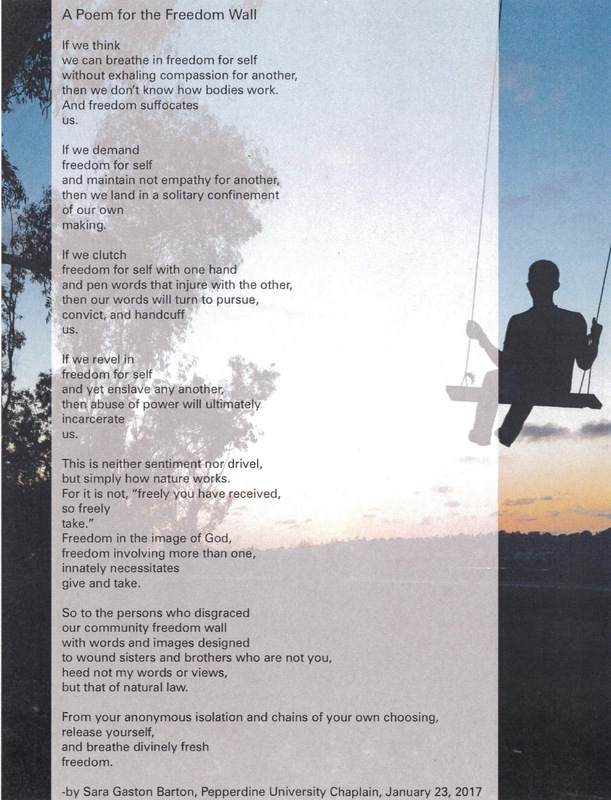 Barton’s poem advances an interpretation of freedom as a zero-sum economy in which claiming more freedom for oneself necessarily involves seizing freedom from some other person, unless one “exhale[es] compassion for another”. At the same time, Barton argues that the amount of freedom one wields in self-interest directly relates to how socially isolated and enslaved one is. Freedom, in a sense, only threatens to put us all back in chains, a word Barton herself employs to describe the plight of the unnamed person who utilized the Wall. “This is neither sentiment nor drivel,” she says, preemptively implying that someone would find the poetry to be sentimental and also drivel. Barton began working as the university chaplain in July of 2014. Before rising to her stewardship over the spiritual development and faith of Pepperdine’s youth, she was a vocal proponent of women in church ministry, authoring a book on the subject. Barton’s tweets reflect her ongoing interest in this and other Feminist causes. In addition to endorsing the much-reported “Women’s March”, the Black Lives Matter movement, egalitarian T-shirts, and husbands submitting to their wives, Barton has been especially active on the social media platform since the election of President Donald Trump. The chaplain’s preferred method of Resistance has entailed issuing a series of #mypresident pound signs in support of President Barack Obama, defending migrant rights on the basis of Jesus being a refugee of King Herod, and retweeting a profile posing as a character invented by J.K. Rowling, who subsequently clarified that the oldest, wisest character in the popular children’s series was a closeted homosexual. Over the last year, Pepperdine swapped DirecTV service for Rokus in all living areas, destroyed a parking lot and stripped out 84 beds, got rid of a Bank of America ATM in the main plaza, shipped the aforementioned Columbus statue to Europe, and removed both a frozen yogurt machine and mural artwork from the main cafeteria so as to free up more white space on the wall. Pepperdine also fired resident directors Michael Harri and Brittney Patag for setting off a fire alarm in an unoccupied building that the school had already planned to demolish before anyone would enter it again. None of the student advisors under the authority of the directors were alerted to the firing until well after the decision had been made. With all that said, as the needs of the university continue to rise by a paltry 4% each year, here is a joyous and fast-paced video documenting a year in the life at Pepperdine that the Author unconsciously edited to LCD Soundsystem’s resounding and beautiful Someone Great, a seemingly cheery, dance-inducing single which, much like Pepperdine, is actually really sad when examined and pondered more deeply.